After the publication of our work , we detected that one of the species analyzed in the study, Astatotilapia latifasciata (Figure 1), was erroneously identified as Haplochromis obliquidens. 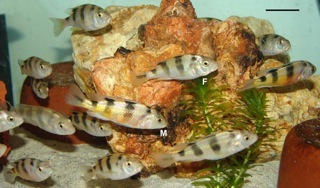 This species was described as Haplochromis latifasciatus  and later ascribed to the genus Astatotilapia . Our mistake comes from the fact that this species is also frequently listed as Haplochromis "zebra obliquidens" in the aquarium trade. Astatotilapia latifasciata has been reported to occur in Lake Nawampasa a small satellite lake of the much larger Lake Kyoga, and in Lake Kyoga located north of Lake Victoria in Uganda . Specimens of Astatotilapia latifasciata. M, male; F, female. Scale bar, 3 cm.